I came across a rank on a QSA today that I hadn't seen before. This QSA is for sale at the next Bonhams auction and is named to Amb. Agent Tara Chand. Ambulance Est. According to the write-up, Tara Chand served in charge of the Dooly Bearers of the Ambulance Establishment Bengal Command. He is confirmed on the roll as Second Grade Ambulance Agent and is noted as receiving a silver medal and the only one with a clasp. Not uncommon. Six on the roll! Is that 6 to that unit or 6 in total. That would be six in total. I would equate the rank to a "labour broker" in that the agent heads the list of doolie bearers. Did he recruit, organize and pay his team I am not sure. The QSA and KSA to Augustus J B O'Callaghan who was a civilian serving with the ASC. His medals are named to Superintendent of Transport, a non-miltary rank. O'Callaghan left Southampton for the Cape in 1896 on board the SS Scott. At the time he was aged 23 and gave his occupation as traveller. 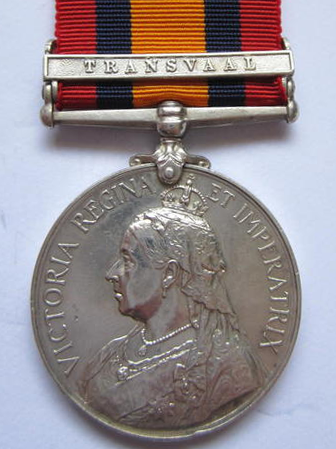 An unusual rank found on a medal to Imperial Transport Service, a unit that was contracted to provide transport to the army and comprised men from Julius Weil Imperial Transport Service and R. Crosbie Transport companies. There are 129 names on the Crosbie roll, and after removing drawn through entries there is a balance of 106 names. However this roll is very faint and there is no indication of medals issued to Cape Town or the figure normally found in the top left corner, it is difficult to determine how many were actually claimed from this roll. There are 26 men with the rank of Travelling Clerical Staff and just 9 claimed their medal, so a quite unusual rare rank overall. I would assume that these men were educated and served the purpose of travelling to various depots and accounting loads and deliveries as and where they were needed. It is interesting to note that although most qualified for clasps, only a select few were issued as such, the roll clearly stating "Medals Only", I have seen one or two examples over the years and of the three, two had clasps, so were they restored by collectors based on the page with their entry or issued as such?